On two separate occasions this month I had much the same discussion with friends about how we were all scrambling to keep up to date with the latest information on the things that interested us - food, books, films, food events - and how, even with the best intentions, we struggled to share what information we did have. So from now on the Month in Review won't be a digest of the fascinating things I have done during the month, riveting reading though that may be. Instead I thought I could use the blog as a means of spreading the word. This first effort only includes journals, articles and books which I have come across lately which I think might be of interest. In future I hope to get contributions from friends so that I can include up-coming events and reading which covers a broader spectrum. However, given that we have to start somewhere, here is the Month in Review for November 2011. The Australian Humanities Review is an on-line journal published quarterly by ANU which 'provides a forum for open intellectual debate across humanities disciplines, about all aspects of social, cultural and political life, primarily ... with reference to Australia'. 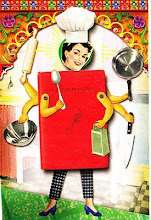 The November 2011 issue is entitled 'On the Table: Food in Our Culture' and can be accessed here. I haven't worked my way through all of it but there are articles by Colin Bannerman, Barbara Santich and Adrian Pearce which are worth a look. Locale The Australasian-Pacific Journal of Regional Food Studies (here) was launched this month. The first issue covers a broad range and includes among others an article by Jacqui Newling on tea in the early days of the Sydney penal settlement, one from Helen Leach (the New Zealand pavlova queen) on regional dishes and one entitled 'Unearthing Paradox: Organic Food and its Tensions'. For the anthropologists, I have only just discovered a new book by Carole M. Counihan, A Tortilla Is Like Life: Food and Culture in the San Luis Valley of Colorado (Austin, University of Texas Press, 2009) which the reviewer in Gastronomica described as a 'beautiful feminist ethnography'. And finally I had a bit of a chuckle over this piece from The Guardian, a review of Elizabeth David's French Country Cooking first published in 1951. Needless to say Ms David remains well know whereas the author of the review, Lucie Marion, - well have you ever heard of her? Ms. Marion had herself published a book on French cooking, Be Your Own Chef: Simple French Cooking in 1948 and no doubt saw ED for the rival that she was. Whilst her criticism of ED may well be justified it didn't do her any good. For anyone who has the time or the inclination to venture to Melbourne the programme for the Wine and Food Festival in March 2012 is now available. One of my criticisms about the similar event in Sydney is that it centres on restaurants and chefs rather than programming a wider range of cultural offerings. Well not so in Melbourne where they include a week of Foodie Films!